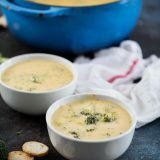 The easiest and the best Broccoli Cheese Soup – this soup recipe is high on the list of our favorites. Super creamy and cheesy this version of Broccoli Cheese Soup will rival many restaurant versions. In a large heavy bottomed soup pot or Dutch oven, melt the butter over medium heat. Add the onion and cook until softened, 3-5 minutes. Stir in the chopped broccoli. Add the chicken broth. Simmer until the broccoli is tender, 10-15 minutes. Reduce the heat and stir in the cheese cubes until they are melted. (I will sometimes use a whisk at this point to make sure the cheese melts in completely.) Stir in the cheddar cheese until melted. Then stir in the milk and the garlic powder. In a small bowl, mix together the cornstarch and the water until the cornstarch is dissolved. Stir the mixture into the soup. Stir until the soup is thickened.